If you're looking for an Inspirational Youth Speaker with a powerful message who delivers life advice for youth and teens, then book Doug Dvorak for your next school assembly or youth program. Doug Dvorak’s unique presentation topics encourage and empower teens to excel on a personal level, which in turn creates a higher level of self-esteem, self-respect and academic success! For an inspirational, motivational youth speaker with professional comedic experience, Doug Dvorak's life advice for teens will empower and motivate any youth or teen to excel in school and everyday life. Doug Dvorak's experience as a Second City Improvisational Actor gives him a totally unique and fresh approach that teenagers can relate to. Doug Dvorak is the best inspirational professional motivational speaker in America today. Doug Dvorak is also a Certified Speaking Professional (CSP). Doug Dvorak earned his Certified Speaking Professional designation through the National Speakers Association (NSA) early in his speaking career. The CSP is the hallmark of the expert who speaks professionally. The Certified Speaking Professional designation, established in 1980, is the speaking industry's international measure of professional platform skill. The CSP is conferred by the National Speakers Association (NSA) only on those accomplished speakers who have earned it by meeting strict criteria. The letters CSP following a speaker’s name indicate a speaking professional with proven experience who understands what is required to speak professionally and knows how to deliver client satisfaction. Doug conducts high-content, personalized presentations and workshops. He speaks to all ages of youth, college students and high school students who appreciate his customized motivational inspirational speaker programs, which never fail to bring smiles to student’s faces. Regardless of Doug’s comical presentations, he is a accomplish business professional whose primary goal is client and student satisfaction and well-being. 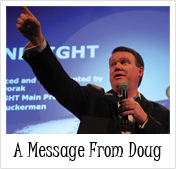 In addition, Doug is an active member of the National Speaker’s Association® (NSA®). 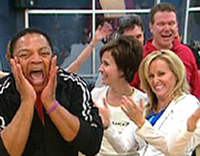 Internationally renowned Motivational Humorous Speaker Doug Dvorak, LAUGHS with Oprah’s Emmy Award Winning Make-Up Artist, Reggie Wells at a Laughter Yoga session. Doug Dvorak participated and helped in the filming and location selection for the piece that aired “Live” on The Oprah Show, April 11th, 2007. Doug Dvorak is the author of the forthcoming book BUILD YOUR OWN BRAND (Pelican, 2009). Doug’s life coaching will fill your assembly with students who will be thinking and laughing their way to higher self-development. A good mix of humor and motivation will make sure your students excel not only in the world of academia, but also in life! Motivational humorous speaker notes; motivational humorous speakers maintain a code of professional ethics in the motivational humorous speaker industry. 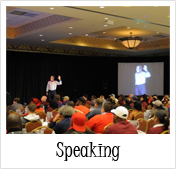 Motivational Humorous speakers can bring humor to a group devoid of humor. 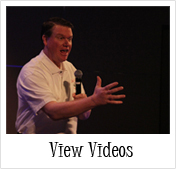 Motivational humorous speakers can be humorous themselves. If you would like to pursue a motivational humorous speaker career in the motivational humorous speaker industry. Please contact the best motivational humorous speaker in the motivational humorous speaker industry – motivational humorous speaker Doug Dvorak. Doug is also a contributing Author to the best selling book, “The Masters of Success”, featuring Ken Blanchard – “One-Minute Manager” and Jack Canfield – “Chicken Soup for the Soul”.